My friend lent me this book when I expressed interest in reading more PD James. Then we read Death Comes to Pemberley together and I was unimpressed with James. But she urged me to try again, as did many of you. And so I picked up An Unsuitable Job for a Woman almost entirely for its title. It's pretty awesome, right? And entirely up my alley. 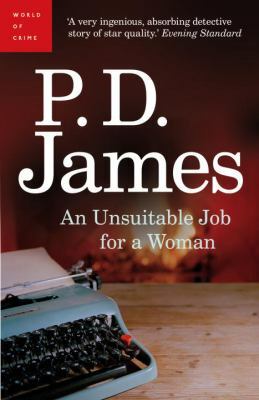 An Unsuitable Job for a Woman is a mystery novel that centers on Cordelia Gray, a private eye who inherits an agency after her partner commits suicide (this is not a spoiler - it happens on page 1). She gets her first job soon after - Sir Robert Callander asks her to investigate the suicide of his son, who hanged himself very suddenly after dropping out of Cambridge and becoming a gardener. Cordelia takes the job and it doesn't take her very long to realize that she isn't investigating a suicide, but a murder. Cordelia Gray is the protagonist of only two books by PD James - according to a review on GoodReads, James was so appalled by the screen version of her girl detective that she stopped writing books about her. I think this is more of a loss to James and to the reading community than to the television industry, but such is life. Gray is a character that readers want to know more about. Her father was an anarchist, but she went to school in a convent. She's very young - just about 22 - but has depended only on herself for many years. She doesn't get close to other people easily, and it doesn't seem like she has many friends at all. But she's smart and tough and there is so much that James could have done with her. I didn't fall in love with this book. The mystery wasn't very compelling to me as when you start a mystery novel, it's fairly obvious that the suicide is really a murder. And the other characters in this novel weren't particularly interesting. What was interesting was the way Cordelia met the censure of the older generation and the ennui of her own generation. I liked that Gray stood up for herself, however subtly it was done. For example, several people in the book tell her that being a private eye is "an unsuitable job for a woman," and she just keeps going with it. But it's hard to understand what drives Cordelia. What makes her tick? I don't feel like I ever found that out. She grew up to be tough, and that was a hard exterior to break through, even as a reader. But there was so much potential! I wish there was more to dig through. Honestly, my reaction to this book was pretty "meh." It was interesting in parts, but uninteresting in others. And while I liked the main character, I thought that the story dragged on far longer than it needed to. PD James still hasn't won me over, but perhaps that's because I haven't read a Dalgliesh mystery yet. I'll give her one more chance! The Dalgliesh ones are the only ones I've liked that much (although mystery is often a "meh" genre for me), so here's a vote for trying one. I should just keep giving her a try, huh? Ok, perhaps I will look into that one, though I am pretty much over James at this point already! I really loved Children of Men and based on that, I tried to read the Pemberley book, without much success. I guess I got lucky the first time with her. Yes, I have a feeling those would be VERY different from each other. Pemberley was a fail for me, too. I've only read Children of Men from what I remember (I may have read something else and found it unremarkable). I really loved CoM too. Yes - I prefer Dalgleish too (try the older ones like Death of an expert witness). I too loved Children of Men which is very atypical. Well, looks like I should read Children of Men! I've never read PD James, but this review pretty much word-for-word describes my feelings about the Maisie Dobbs series. There was so much potential in the character, but I never really got to the bottom of her, and eventually ran out of enthusiasm for trying. Same! I only read the first Maisie Dobbs book but I just wasn't a fan. I was highly skeptical of the whole "assume someone else's stance and obtain a lot of insight into his person" idea. Sad that James stopped writing the character because of the screen version, though very understandable. Makes you wonder on the whole concept of directors and casting directors taking over from the author. That you'll give her another chance is very fair given you've already read two books! My godmother steered me towards P D James a long time ago, and I have to agree that the Dalgleish books were her strongest. Not necessarily 'must read' but if you're inclined to try I'd recommend her mid period books - around the time of A Taste for Death and Devices & Desires - over the others. The Cordelia Gray always felt like a experiment rather than something fully formed to me. But a pity P D James abandoned them, because the potential was there. I remember the show very vividly. I found it quite, quite creepy and scary. A woman alone in a house. A well. Still available at Netflix. It might be interesting for you to compare since you just read the book. I came to PD James' writing from the televised versions of the Dalgliesh books. Her work is very detailed, thoughtful, precise. Some might say slow. But that's the kind of book I like. I still remember whole parts of a few of them; most particularly A Taste For Death which included stigmata, the first time I had ever heard of it. I think she is quite brilliant, and I keep thinking I should give myself a straight month of just her work. Dalgliesh - you have to read one! He is a detective that is so very thoughtful and sensitive, and very engaging too. Nan is right, her writing is detailed and thoughtful. I find that part of what makes them good because you can see this is how Dalgliesh is too, and why murder is such a disruption to the flow of life. I loved Cordelia Gray, I read both her mysteries some years ago. She is considered one of the forerunners of the female PI in modern detective fiction. I was Cordelia's generation, so really related to how she found herself doing something no one approved of, and how she handled it. I also have to say I enjoyed the tv series (I've seen both the Gray series, and Dalgliesh), and they were really well done. The Gray series did go off away from the books, and that's what got the author upset, what they did with the character. I prefer the book version, though both were fun in their own way. I never managed to get into reading PD James, so I cheat and watch the TV series instead. I read this title as well as another title "Cover Her Face". While I enjoyed the latter a lot, Cordelia Gray's adventures sounded so watered down and uninteresting that I had to speed read just to mark the book as "read".